Explore the types of records for doing genealogical research in Iowa. Each county is fully covered, plus holdings in libraries and courthouse records. There are hundreds of URLs. Some of the topics ... Ethnic Settlements; Iowa's Large Repositories and Archives; Religious Records; Orphan Trains and City Directories. Ruby Coleman, who resides in North Platte, Nebraska, spends a good deal of her time doing genealogical research on her families in Nebraska and the plains states, and also professionally. She has lived in Colorado, Wyoming, South Dakota, Iowa, and Nebraska. She has written articles for Ancestry, Heritage Quest, The Genealogical Helper, Family Chronicle and Internet Genealogy. For thirteen years she wrote the column, "Heritage Lines" for the North Platte Telegraph, North Platte, NE. 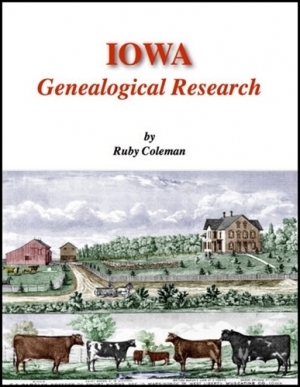 Her book, Iowa Genealogical Records was published in January of 2014. She lectures for the Family History Expo. Currently Coleman is Area 7 Representative for the Nebraska State Genealogical Society and a past president of the North Platte Genealogical Society. Using her knowledge of Nebraska and the plain states genealogy and history, plus genealogical methodology, Coleman writes, lectures and teaches genealogy. She is a member of the Association of Professional Genealogists as well as numerous local, state and national genealogical organizations. In 2011 she was named 2011 Nebraska Genealogist of the Year by the Nebraska Genealogical Society.